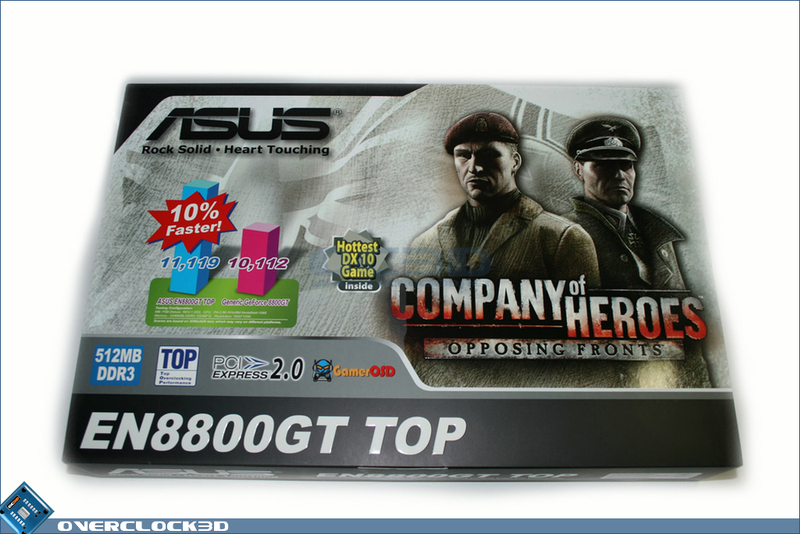 The packaging on the Asus 8800 GT is pretty huge to say the least. 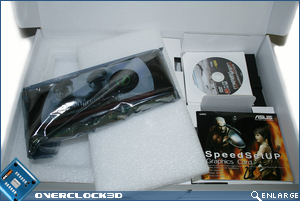 Double the size of the XFX packaging, it definitely looks impressive when it gets through your door. The packaging is very much dominated by the large Company of Heroes figures on the box. The game is very obviously included in the package! This will of course stand out on shelves. 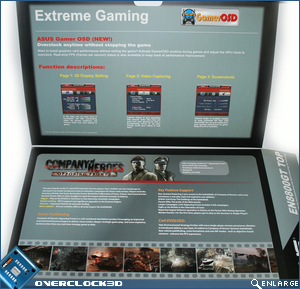 The box has a flap that opens that goes more in-depth into the cards features as well. 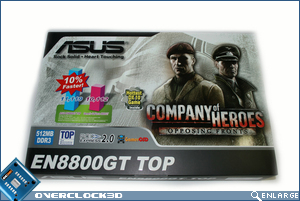 Protected very well from the elements with a huge box and loads of padding, your Asus 8800 GT isn't going to get damaged! Pretty nice, and the AA title Company of Heroes is a great inclusion (seeing as we are now using the full retail version with the DX10 patch for testing!). 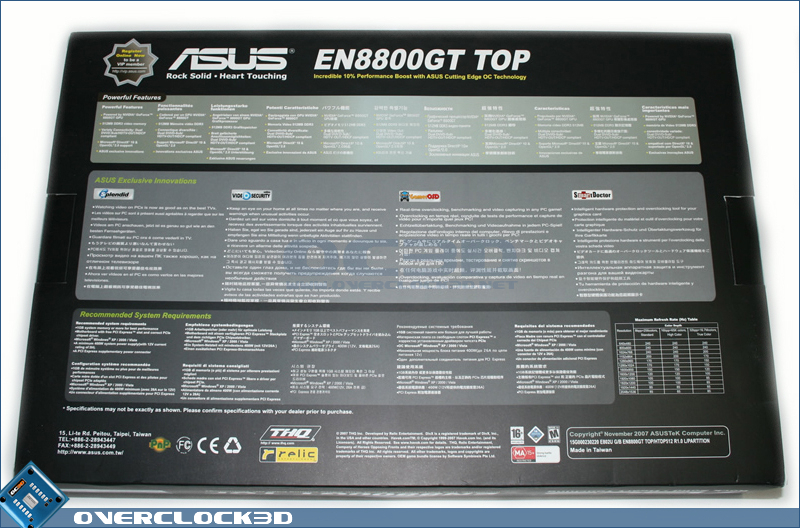 Asus have gone with the reference Nvidia design for their EN8800 GT Top. 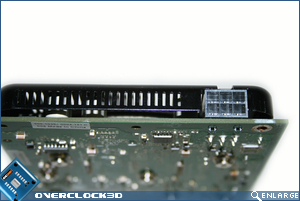 This design is a single slot copper-based heatpipe cooler with Aluminium fins. As on the reference design, Asus have stuck with the green PCB. 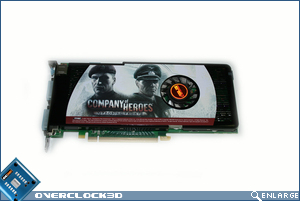 Adorning the front of the heatsink is again a large logo and figure from Company of Heroes, a good move if you're a fan of the game...not so much if you aren't. 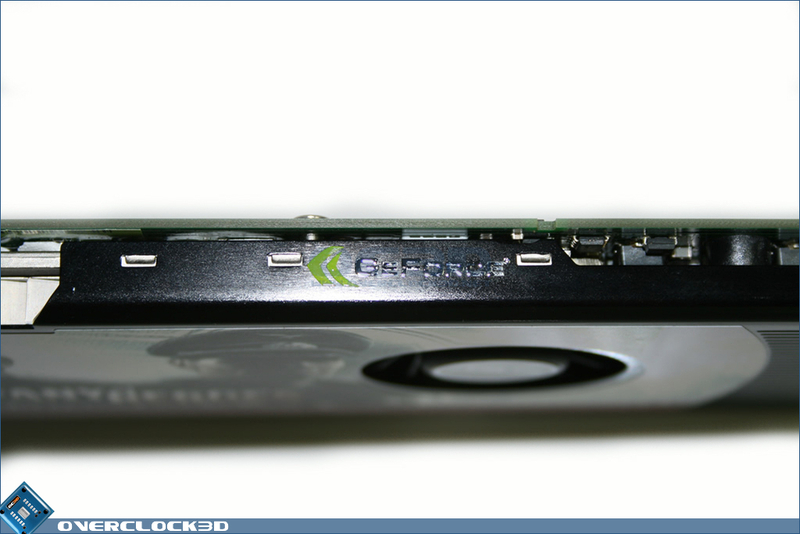 The addition of the Nvidia Geforce logo on the side of the card is the same as the reference card again, but nice if you have a case with a window. 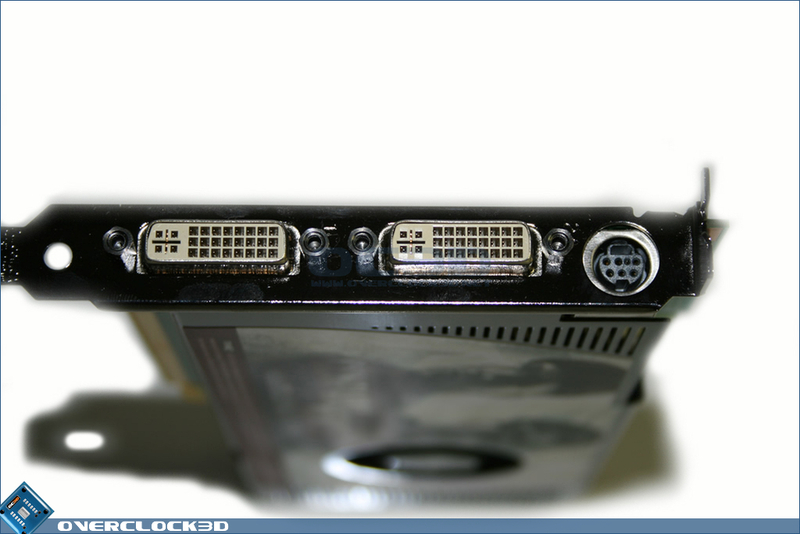 Asus have done well in covering up anything that could get damaged as we can see above with the plastic on the SLI connector. 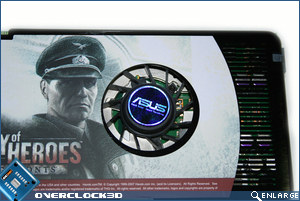 Unlike previous incarnations of the Top edition cards, Asus have decided against a retention mechanism to keep the card straight. 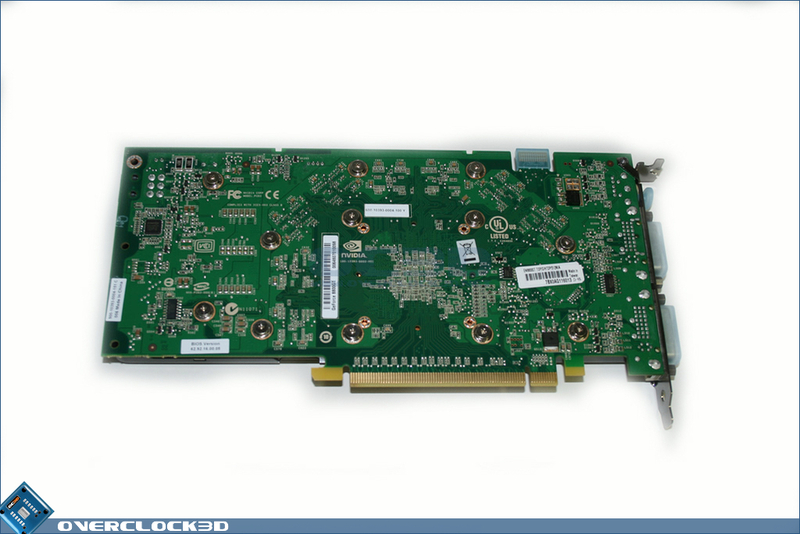 The card has two Dual Link DVI's and TV-out. 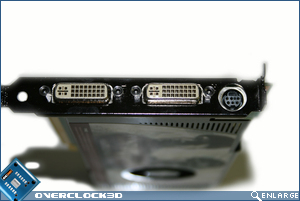 This means that you should be absolutely fine running pretty much any monitor you can buy, as you should be able to. 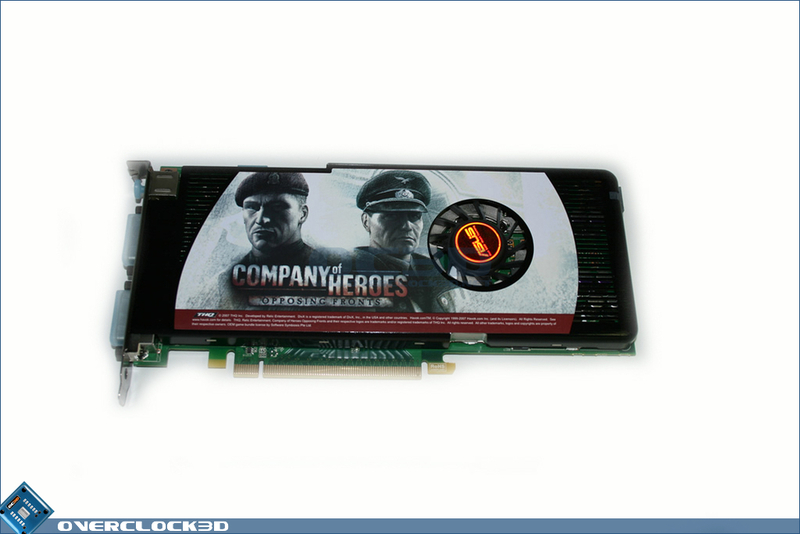 HDCP is also included and implemented by Asus, as most of the other Nvidia AIB's have also done. Again, as I previously stated in the 8800 GT review, the noise from the cooler is not too bad, if the fan doesn't start ramping up. However, set it to full...it makes your ears bleed. Thankfully this didn't happen during gaming or testing, but don't think manual fan control is an option if you like to be able to hear yourself think! 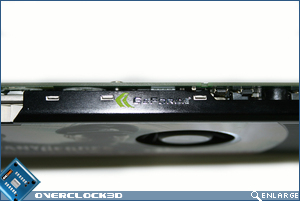 Great insight into the higher end of the gpu spectrum. I have to be fair, even tho u`ve got a 1 to 4 positioning, I don`t think there`s that much in it for any of them. 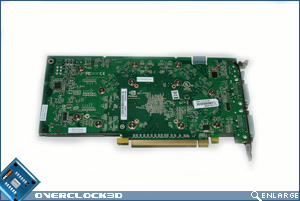 I know the Ati slides in the rankings, but it does show itself to be a fine card. An interesting comparison would have been performance versus costing, seeing as they`re as close as they appear to be. I`m a bit at odds with the oc results too. 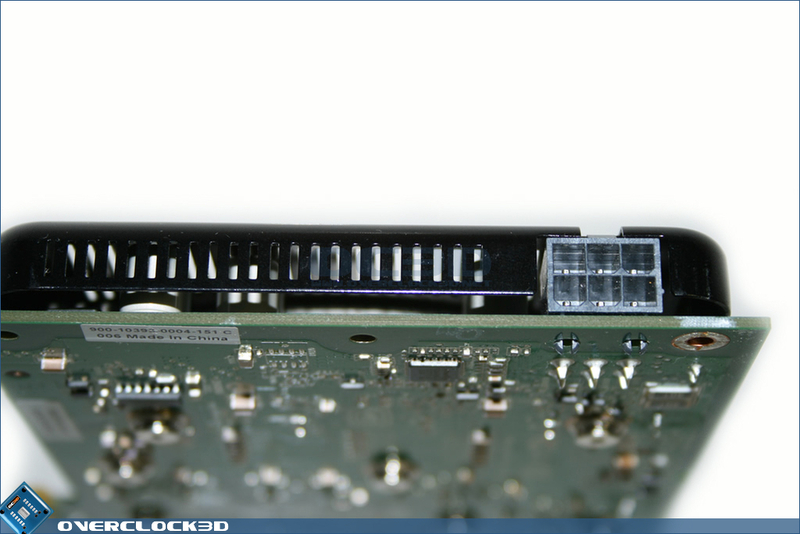 I simply can`t achieve the memory overclock on my GT without it having fits. 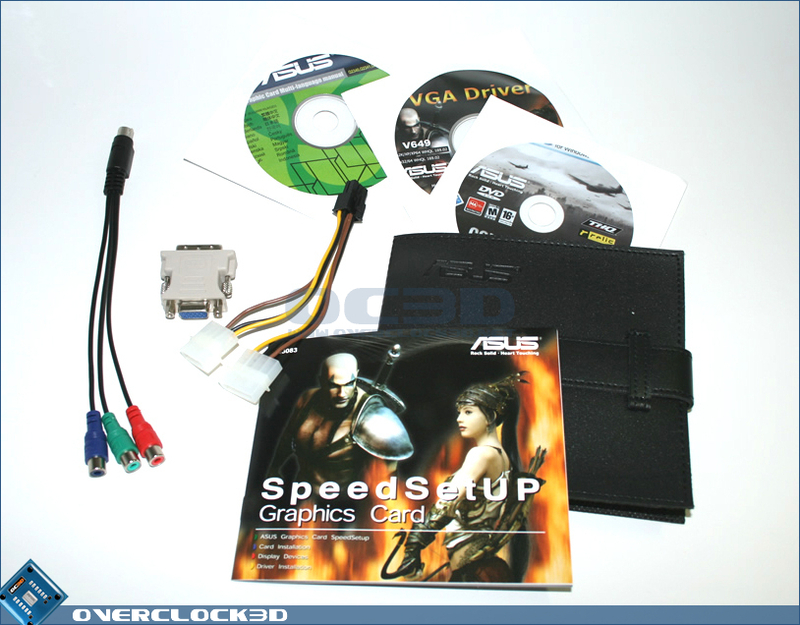 But I can clock the gpu to around 720 (from 670). What would impress me is some1 buying the cheapest GT, putting it under water, and claiming back those clock hertz with their superior cooling. Sounds nice. Thing is though there is a BIOS voltmod for the 8800GT that GREATLY increases its overclockability. 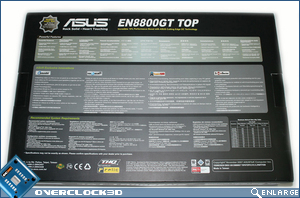 If there isn't one for the 8800GTS I see them both reaching high limits but so far the 8800GT seems to OC better. 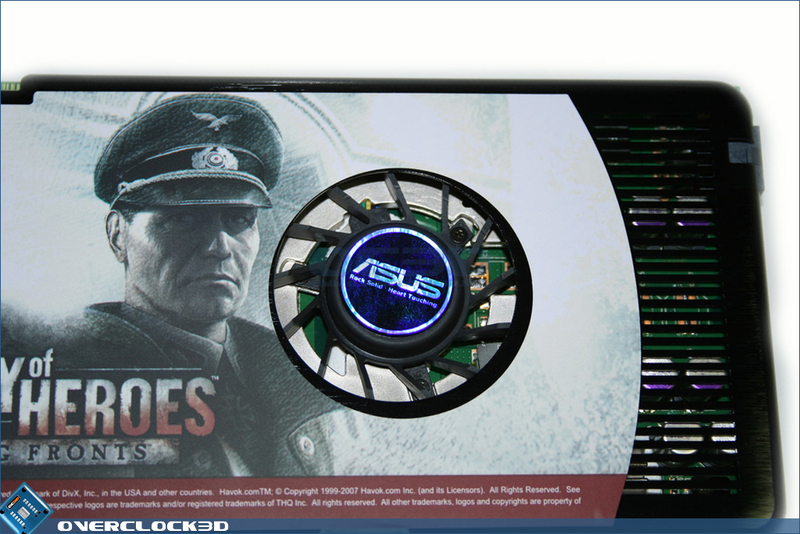 With good cooling and the volt mod this thing easily passes 800mhz core, I've seen some at 850+. What you also go to look at as well is shaders, they seem to be the key thing atm if the shaders OC much better on the 8800GT, which I guess they kinda should since they could simply lock the worst performing ones to get it top out better, it could impact performance in certain titles a lot. Nice review though I was surprised the 8800GT didn't clock more, there wasn't a heat issue was there? 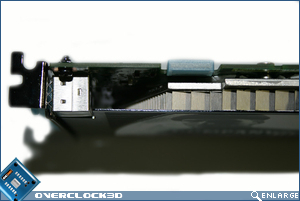 Volt-modding is not part of the overclocking testing as the percentage of users who do that is small and it voids any warranty you have.